Club Penguin Cheats by Mimo777 Club Penguin Cheats by Mimo777: HUGE Club Penguin Coins for Change Glitch! Whoa! Check it out! 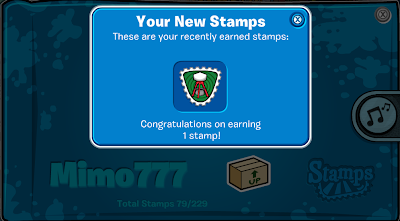 You can earn your Volunteer and Top Volunteer Stamps without actually donating any coins! I did have to "donate" 5000 coins twice to get both stamps! Weird huh? This really doesn't seem fair to earn stamps without really giving to the cause, so I hope Club Penguin fixes it soon. 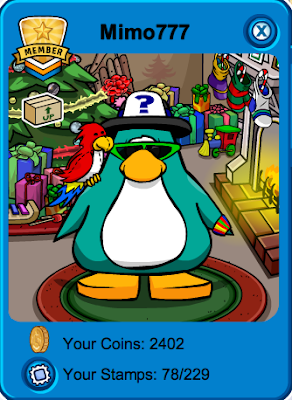 I earned them for real, since I have more than 5,000 coins. But it's a really cool glitch!! You can throw ordimates in the new room! But what if you have more than 5000 coins? Will you actually donate the coins, or will you just get a stamp? I found this out too! I think you can donate coins even if you don't have any! i was gonna tell you! I earned one stamp but got the other from donating. I got the glitch for the volunteer stamp but then i donated 1000 coins :D oh and anyway does 1000 coins mean $10.00 are donated or does it mean $1000.00 are donated? Omg Mimo i have found a glich when you go to the hidden room and it says joining ??? I had $11,000 coins because I am not a member and there is nothing to buy as a non-member. Hey, I now know why there are gifts all over the island on the floor: because the penguins on the sleigh missed the chimney. LOL! Both! You will donate the coins and get a stamp! I donated over 50,000 coins! Plus, remember about the fish room and the notice board room? I think that the room where u throw the ornaments with the giant tree (which is really painful) well i think that that room is gonna turn into that room!! mimo! i still cant play dj3k please help! you can throw ornaments in the new room :) and in the pizza parlour there is a huge table and if you clikc on the food it all changes and the map has the northern lights on it and the iceberg doesnt have the tree like it has done evry year? I got the volunteer stamp without paying but I didn't really notice it but I did actually donate 5000coins. Mimo! I found a glitch. If you put on the pink bunny slippers while wearing long johns, they don't show up on your penguin! (Just like the candy cane wing warmers). i have like 1500 coins so i earned it on my own. P.S. what did you donate for mimo? i donated for health and builing homes and schools. Not long ago you posted a comment on The Stadium glitche thing. First off, I have also wondered how the tubes are here without rockhopper actually arriving. Although this doesnt really matter considering The Christmas Party has already started. Secondly, yes I was one of the Grand Winners In the Halloween Contest. The newspaper with mine it has gone :(. It was in the First Round. I had over 5'000 coins anyway! I earned them for real. I thought i was going to get t-shirts but i got stamps. Silly me. 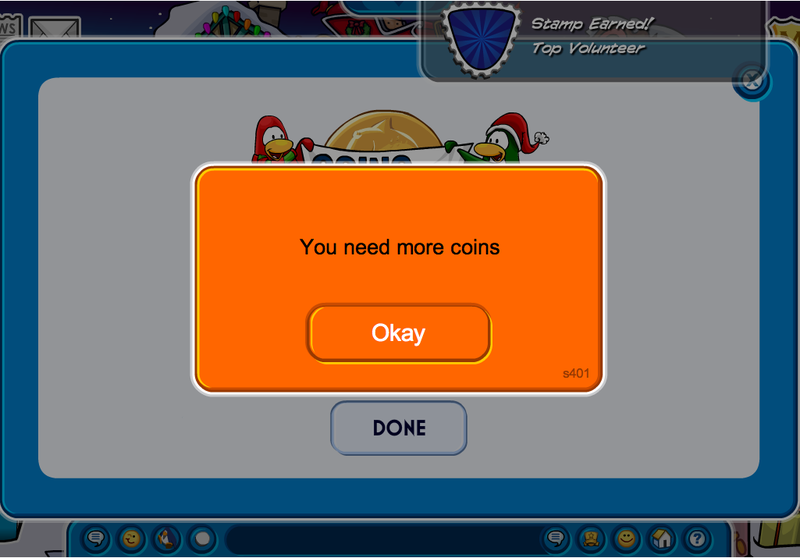 thats strange because i donated 5000 coins and i didnt get ANY stamps!! P.S. I made an account with the name Oldcprulz and it didn't let me take it as a name LOLZ. Wow! I've never actually seen somebody I know that won a CP contest! Congrats! And nice igloo LOL! I donated 100,000 coins when it started and I got no stamps! and o ya in the light house the snowballs are coins! sorry thats not a glitch since the room was put there for the party its a mystorie room so its ???. Hey Mimo777 have you realised that on the background you have the fire is moving. Pretty awesome. Love your work. I earned it for real and then i wanted to see if i can donate coins without as certain amount so i went on my sisters account and click on 5,000 and i found the glitch. It might actually go to the cause! Because when you have done the glitch it says "Thank you for donating your coins" So maybe Club penguin is just scamming us for our coins. The lighthouse is getting even more full of coins!Its like a mountain! Feathergreen here again! I donated 5,000 coins and didn't have to pay a cent, and I STILL got the stamps! I think Club Penguin counts that as real money. I earned the stamps normaly because i have 80,000 coins im non-member but i will be for christmas! Hey Mimo! The glitch worked for me before you posted this. 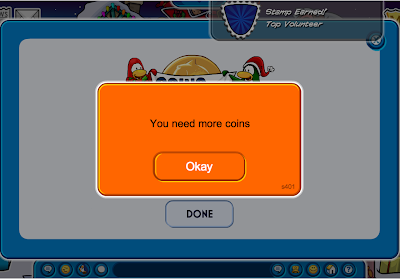 I earned them for real, I actually paid the 5.000 coins. umm if you try to say "smile for Santa" instead you will say "come and help deliver presents"
I did this glitch originally when the party first came out, but I donated more coins later to make up for it. Go to the lighthouse. More coins have built up inside. hey mimo! the pile of coins in the lighthouse has gotten BIGGER! the lighthouse will sonn be flodded with coins! 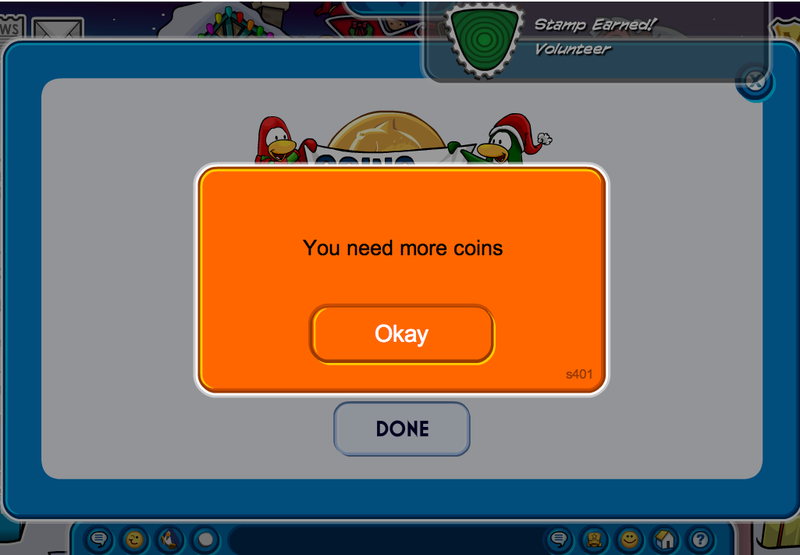 guess wut happend to me i gave 5,000 coins alot of times but i never got the stamp :( WHY ME! Cool the pile in the light house is bigger and now theres more than a small pile on the beacon! i knew it from 3 days but still cool and sick glitch thnx for everyting mimo.!?!>! hey mimo, i was wondering if you can put up the rockhopper tracker. thanks! Cool but if you go to the elf lounge place and go into the sliegh place and press home at the same time you go in the whole room is just white with squares. hi again mimo! i just wanna give u an update. in the lighthouse, the pile of coins has gotten bigger! i hope this helps u out! there is a new server called Zipline.noticed this?u rock mimo!! There are more coins in the lighthouse. There are some in the big red light bulb and the pile in the lighthouse is bigger. THE LIGHTHOUSE JUST FILLED UP WITH MORE COINS!! hey mimo the amount of coins in the lighthouse has increased and now it covers the exit from the beacon! Another glitch - I actually donated 100 coins I had and I did not get the stamp... Later I tried again and it worked. Great! Mimo was just updating all of us though. Mimo! Check out the Lighthouse! It got more coins! Plus it's getting to the Beacon! I think when you give more coins it will show up in the Lighthouse! Go check it out! You really donate the coins. Awesome glitch! Club Penguin may have not named the room yet! Thats so cool! Maybe it depends on the ammount of coins that are given away! Wow, I guess the bigger pile of coins in the lighthouse is no secret. Like a gazillion people have posted it. Mimo coin pile in the lighthouse is huge! Whoops i meant coin bags sorry mimo! KH1016 if you have over 5,000 coins, the glitch doesn't work. Sorry! Thank you for letting Mimo know but Mimo posted about this a while ago. mimo i found another glitch. when i was trying to find my friend all i saw was ??? marks. Cool glitch!! I earned it for REAL.I'm not lieing. I don't lie (too much).